I am fascinated by world religions. Absolutely fascinated. You could call it a passion of study. You could call it an obsession. Yes, you could. I was lucky enough to get to teach a Comparative Religions class at the high school where I worked, so I had an outlet for my madness. 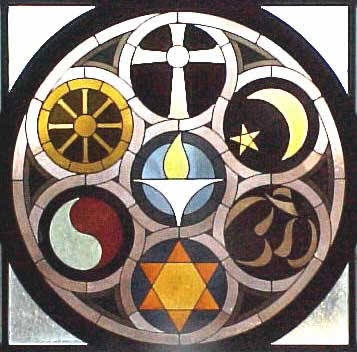 And now I teach a class through my church called World Religions 101: Understanding Theirs So You Can Share Yours. I think that we, as Christians, have a responsibilty to share the Gospel, and we can’t do that effectively unless we understand what others believe. Not everyone is open to the idea of being converted, so walking up to someone of another faith and saying, “Hey, you need Jesus,” is not always going to work. What separates Christianity from all of the other religions is one word–grace. All other religions, it can be argued, are works based, while Christianity is faith based and any works performed are a result of the faith and acceptance of God’s gift of grace through the sacrifice of Jesus Christ. I’m not trying to start a debate about the various religions in the world or break down the doctrine of Christianity, but I do want to present the basics as much as I can to as many as I can. My goal is to educate so that we can effectively witness. I believe it’s something God has called me to; a small way in which I help reach those who need the salvation of Jesus Christ. Of all the religious groups that fascinate me, Mormons top the list. I’m also fascinated by Hinduism, mostly because it’s such an ancient belief system full of brightly colored mythology and detailed traditions that translate into a largely secular population. Call me a nerd (I’ll gladly answer to that), but history has always fascinated me, and I argue that history has been largely driven by religion. Some argue that money makes the world go ’round, others argue it’s politics and power, but I think that when you peel back all historical events, past the money, past the war, past the details that seem innocuous, religion (or blatant lack thereof) can be found at the root of all history. So if you want to learn how to be an effective witness to the lost world, educate yourself on what others believe. Share with me: Is there a world religion, group, or cult that you’d like to learn more about or that fascinates you? Why? J- Scientologists fascinate me, too! I love teaching that topic because most of my students laugh. How can you not? 🙂 All hail Lord Xenu. I'm a history nerd too, Jennifer! I was blessed to go to schools where I learned about world religions also. I'm with Jeannie on the scientology. What makes it so appealing to these stars? I don't know much about it, so I'm interested!